Android WebControl | Send text messages and control your phone directly from your desktop computer or tablet web browser ! 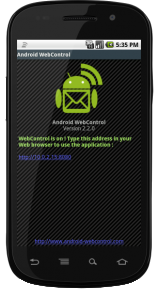 Android WebControl is a free, fast and fun application that lets you send text messages and control your phone directly from your desktop computer or tablet web browser ! Nothing to install, just start your web browser and write your phone’s URL to use the application. It has been designed to be fast and easy to use. Connect your web browser to your phone and use Android WebControl like a desktop. Send SMS to your friends from your computer. Way faster than from your phone ! See your phone contacts information. You are notified when new messages arrives or when you have missed calls.